"Year of Chinese Culture in Turkey 2012" was launched in the Turkish capital Ankara on Monday, with the opening of an exhibition on Chinese paintings. Turkish Minister of Culture and Tourism Ertugrul Gunay (4th. L), Chinese Vice Minister of Culture Yang Zhijin (4th. R) and Chinese Ambassador to Turkey Gong Xiaosheng (3th. L) attend the opening ceremony of the "2012 China Culture Year" in Ankara, Turkey, Dec. 12, 2011. Under the agreement between China and Turkey, the two countries will host the culture year in Turkey in 2012 and in China in 2013. Speaking at the opening ceremony, Chinese vice minister of culture Yang Zhijin said that China is willing to further the cooperation with Turkey on cultural industry. Turkish Minister of Culture and Tourism Ertugrul Gunay said the Turkish people are happy to experience Chinese culture through the event. The painting exhibition -- "Colors from Silk Road", highlighting around 60 works of famous Chinese painters, draw about 400 visitors. A gala performances featuring Peking Opera, acrobatics, folk songs, traditional Chinese instrumental music and other forms of traditional Chinese performing arts was held Monday evening. Chinese Ambassador to Turkey Gong Xiaosheng said the Year of Chinese Culture will also bring Chinese literature, arts, cultural heritages, films, acrobatics, puppet shows, among others, to different Turkish cities. 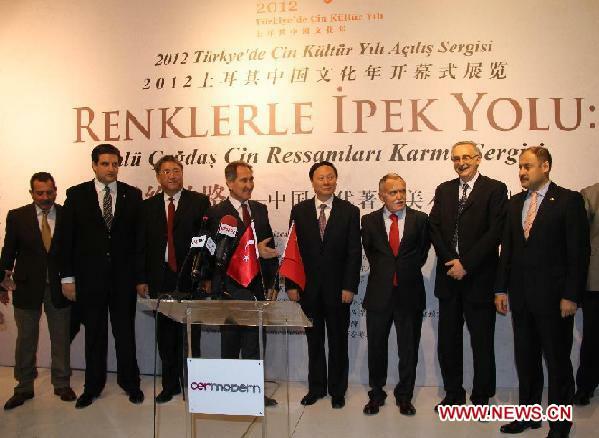 "The Year of Turkish Culture in China" will be marked in 2013.